The Northwestern University Symphony Orchestra stands following their performance of Bernstein’s “Symphonic Dances.” NUSO returned from its 10-day Asia tour on Sunday. Northwestern University Symphony Orchestra returned from its 10-day Asia tour on Sunday, which Prof. Victor Yampolsky, director of orchestras and the group’s conductor, described as “nothing short of a dream.” The trip, which was fully funded by an anonymous donor and his wife, marked the first international tour for NUSO, Yampolsky said. 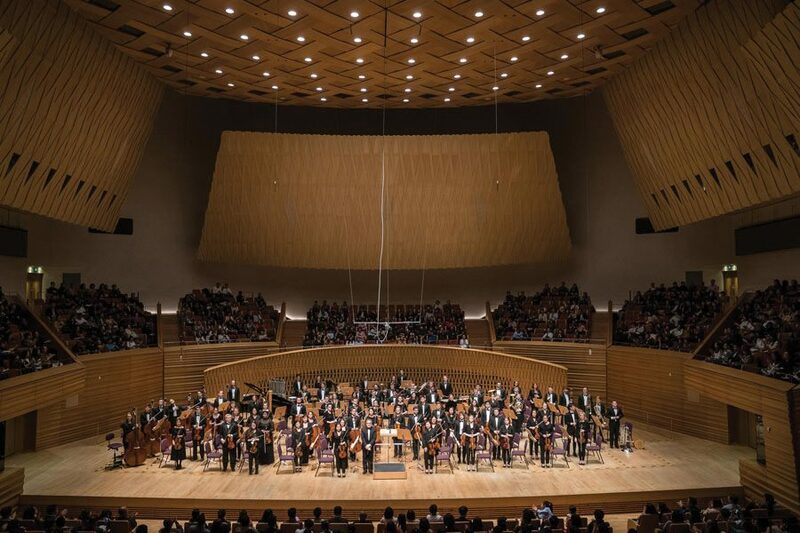 Despite language barriers, scheduling miscalculations and 12-hour jet lag, Yampolsky said NUSO delivered three “outstanding performances” in Beijing, Shanghai and Hong Kong that were met with enthusiastic reception and standing ovations. Yampolsky said the three cities were “very unique,” remarking that the venues and attendees of the performances varied across locations. Danielle Ray, the orchestra librarian and administrative assistant to the orchestras, said she was surprised audience members in Asia seemed to be “less enthusiastic” for Leonard Bernstein’s “Symphonic Dances,” a piece she said often receives multiple curtain calls from American audiences. Yampolsky expressed a similar sentiment, and said he was shocked following the performance of Bernstein’s piece in Beijing. In contrast, the group’s second piece — Gustav Mahler’s “Symphony No. 5” — was met with wide acclaim, said Jerry Tietz, Bienen School of Music’s director of concert management. In addition to showcasing the talent of Northwestern musicians internationally, Tietz said one of the tour’s underlying goals was to strengthen alumni and donor relations. NUSO performed for more than 1,000 people at each of the three venues, including about 250 to 400 alumni who were invited to a reception following each show. As a result of the tour, Yampolsky said Bienen received two significant scholarships from two anonymous donors — one for $1.5 million and another for $500,000. While the three concerts remained the focus of NUSO’s trip, musicians also had the opportunity to explore each city through group programming and free time, visiting sites like the Great Wall and Tiananmen Square in Beijing, and local markets in Shanghai and Hong Kong, Tietz said. Bienen sophomore Tara Pagano-Toub, a violinist in NUSO, said the “emotional investment” of the group noticeably changed between their first and last performance. The tour, she said, brought the orchestra together in a way she had never seen before. Yampolsky said while the impact of the trip cannot fully be measured yet, he is optimistic that the tour will positively affect application numbers and Bienen’s reputation going forward. The tour reaffirmed not only the professionalism and caliber of NUSO’s musicians, but their admirable “human qualities” as well, Yampolsky said.